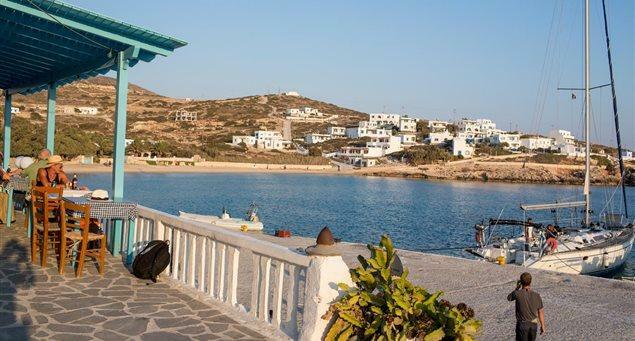 An acquaintance with Donoussa starts from Stavros (or Kampos, as the locals call it), which is the island’s port and main settlement. Situated around a sheltered bay on the island’s northwestern coast, it exudes a hospitable ambiance that makes you feel welcome right away. With whitewashed houses and slab-paved alleyways that start from the sea and climb to the highest points of the surrounding hills, it has an authentic Cycladic character and accounts for the largest part of the island’s tourist business. The pretty churches of Timios Stavros (Holy Cross) and Panagia-Ai Giannis add to the picturesque character of Stavros. Big fetes are held on their annual celebration days, September 14 and August 15 respectively. Timios Stavros -the island’s holy patron- is a whitewashed church of sparse architectural style, with a blue dome and an ornate bell stand, in the center of the settlement. It was built in 1902 after a fund-raising campaign organized by Dimitrios Skopelitis in order to replace the original church of Timios Stavros that stood further downhill and was destroyed by a strong storm at the end of the 19th century. It is said that the only thing that was saved from the old church was the icon of the Cross –found on a sandy beach on the neighboring island of Amorgos by local fishermen. The church of Panagia (Virgin Mary)-Ai Giannis is an uncommon architectural combination of two basilicas under a single bell, dominating a hilltop east of the settlement of Stavros. The chapel of Panagia was built first at the end of the 19th century while Ai Giannis (Agios Ioannis) was added adjacently later. Stavros is the island’s tourism hub, with many rooms to let, tavernas, bars and all public services. 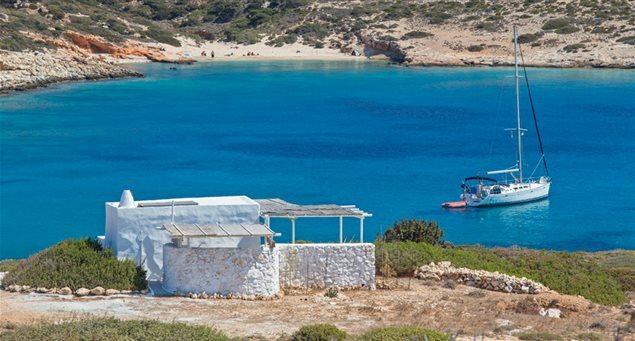 The smaller pier inside the harbor offers very safe anchorage for boats, while Stavros beach, next to the port, is among Donoussa’s prettiest. The island’s main road connects Stavros with three other settlements, Messaria, Merssini and Kalotaritissa. Also, several footpaths begin from Stavros, ending in various parts of Donoussa. The longest is the one that takes you to Kalotaritissa in the north. Another leads to Troulos, an upland settlement a short distance from Stavros almost abandoned now, with just one inhabited house. 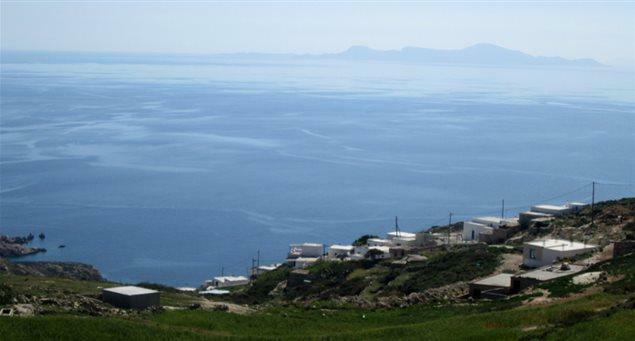 From the port of Stavros, either via the main road or a beautiful, old cobbled footpath, you reach the traditional settlement of Messaria, which enjoys a singular view of Amorgos, Makares islets and Naxos’ eastern side. Many of the village’s low-leveled stone houses are nowadays dilapidated, while its winter residents are numbered. 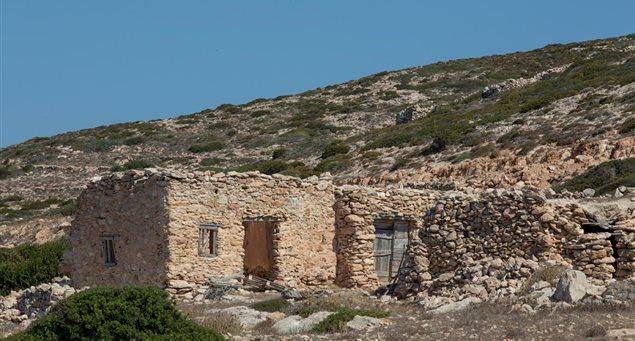 However, it was a different story up until 1970, when Messaria, then known as Charavgi, stood as the island’s main settlement with a forge facility for metalworking and a wood-burning oven that catered to the needs of all locals. Two abandoned windmills just outside the village, out of use since the ‘70s, stand as reminders of the past. They are accessible via footpaths that start from the village –the best preserved one being the one above Vathy Limenari position. On the peninsula east of Vathy Limenari, which you will reach if you continue along the same footpath that leads to the windmill, lie the ruins of a Geometric era settlement that was built on the remains of an older, Bronze era hamlet. The excavations, carried out between 1968 and 1973, brought to light part of the defensive wall and 12 rectangular buildings, most of which were two-spaced with a flat roof. The particular settlement is one of the few fortified ones of this period that have been discovered in the Cyclades, while a large part of it on the southern side appears to have sunk in the sea. The rich collection of ceramic items found here includes large vessels for the storage and transportation of liquids, smaller table vessels, cooking utensils etc, and is kept at the Naxos Archaeological Museum. The main road then leads to Merssini,an upland village perched on a steep slope on the eastern side, with gorgeous views of the sea and Amorgos. With low, flat-roofed houses and idyllic spots all around, Merssini attracts many visitors who, besides the beauty of the place, can enjoy good food at the two tavernas that are open throughout the day in the summer months. Merssini’s standout feature –rare in the Cyclades- is a water spring next to an age-old plane tree, where the annual celebration of the village church, Agia Sophia,is held on September 17. The church, whitewashed with a blue dome, stands on a hilltop with superb views on the edge of the settlement, and can be seen from afar. The old folk used to say that the water of the spring came from as far as the island of Ikaria to the east. A footpath from Merssini leads to two of the island’s most attractive beaches, Livadi and Fykio. The road ends at Kalotaritissa, a small, picturesque fishing village at the foot of Mt. Papas, in Donoussa’s northeastern tip. It has a few low, stone-built houses with blue and green doors and windows, and adorned with basils and bougainvilleas. A particular feature is the impressive old juniper trees on the hills around the village. The whitewashed church of Agios Georgios, built in 1985 and featuring a pretty bell tower, is in the same frugal style. A traditional tavern operates in the summer months. The bay of Kalotaritissa features the pretty beaches of Sapounochoma, Vlycho, Messa Ammos and Trypiti, while Skoulonissi islet is off its northeastern tip.